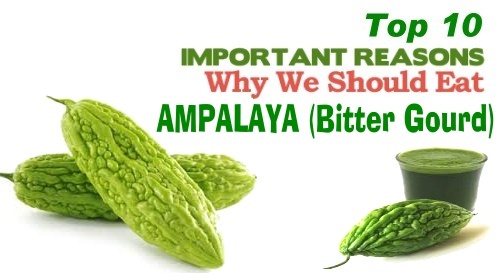 Amazing Health Benefits of Ampalaya or Bitter Gourd..
Home » Food » Juice » Amazing Health Benefits of Ampalaya or Bitter Gourd..
Ampalaya is common known as Bitter Gourd. It is a long vegetable with green color and has bumpy gourd. There are two types of Ampalaya. The first one is long with pale green color and second type is smaller with dark green color. They have red or white seeds, which depends on how ripe they are. If the seeds are dark then the vegetable is bitterer. It originated from Asia and South America. It is very popular in Asia because of its numerous health benefits. In Asia it is especially used as remedy against diabetes. It can be found in the stores in form of pills, tea, juice and extract. 01: Relieves cold - ampalaya is used in treating fever and cough caused by cold. It has anti-inflammatory properties and that is why it is used against mucus accumulation and chest congestion. 02:Disinfectant - It is used against bacteria as it has strong powerful antibiotic properties. It can be used as a disinfectant for minor wounds, burns and scrapes. 03:Lowers Blood Sugar Level - Ampalaya is used against diabetes. It is able to reduce the blood sugar level and prevents other side-effects caused by high blood sugar. 04:Immunity booster - It removes free radicals from the body and fights infections which can lead to tissue and organ damage. 05:Lowers Blood Pressure - It lowers the blood pressure because it is able to relax the vascular system. Lowering the high blood pressure is an important function because it can protect people from having a heart attack or stroke. 06:Headache relief - When the muscles around brain are under pressure, they cause headaches. Ampalaya reduces the pressure and alleviates headaches. Stress usually causes the pressure but ampalaya also helps in relieving tension and stress. 07:Improves Psoriasis - People who suffer from psoriasis have confirmed that this plant has helped them a lot. Ampalaya juice can also help with fungal infections as athlete’s foot and fungi. 08:Spleen and liver protection - overuse of alcohol and toxins can lead to damaged spleen and liver. This vegetable can regenerate and repair tissues in the body which were damaged by toxins. Ampalaya contains useful enzymes which maintain proper spleen and liver function. 09:Weight control - Obesity is linked with numerous health problems like diabetes, high blood pressure, heart disease and many others. A study showed that amapalaya juice is effective in preventing fat cells from forming. 10:Eye problems - Ampalaya is rich in beta-carotene and other minerals which help with eye problems.